By Andrea Koczela. Jan 18, 2015. 9:00 AM. Today we celebrate the life of A. A. Milne, beloved author and creator of Winnie-the-Pooh. Although renowned as a novelist and playwright during his own lifetime, his children's stories—inspired by his son, Christopher Robin—have become Milne's enduring legacy. 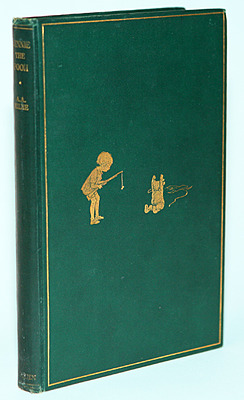 Illustrated by Ernest H. Shepard, his story collections Winnie-the-Pooh (1926) and The House at Pooh Corner (1928)—not to mention his poetry collections When We Were Very Young (1924) and Now We Are Six (1927)—have become indispensable children's classics. 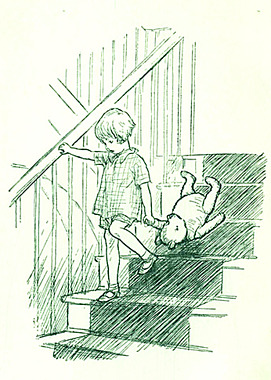 The character Winnie-the-Pooh first diverged into the "classic" version (illustrated by Shepard) and the "Disney" version (illustrated by Stephen Slesinger) when Milne sold the rights to Slesinger in 1930. However, it wasn't until 1961 that Milne's widow sold the rights to Disney. It was in the 1960s that the Disney marketing machine cranked into gear, creating toys, films, television, and books that were inspired by Milne's work but often quite different. 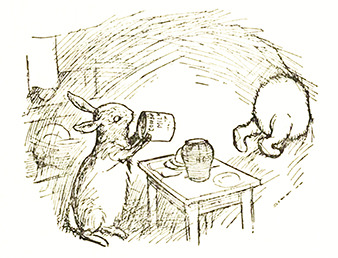 For example, the most widely shared Winnie-the-Pooh quote ("If you live to be a hundred, I want to live to be a hundred minus one day, so I never have to live without you.") was not written by Milne. The same is true for many other oft-cited Winnie-the-Pooh quotes, including, "Promise me you'll always remember: you're braver than you believe, and stronger than you seem, and smarter than you think." "Christopher Robin came down from the Forest to the bridge, feeling all sunny and careless, and just as if twice nineteen didn't matter a bit, as it didn't on such a happy afternoon, and he thought that if he stood on the bottom rail of the bridge, and leant over, and watched the river slipping slowly away beneath him, then he would suddenly know everything that there was to be known, and he would be able to tell Pooh, who wasn't quite sure about some of it." 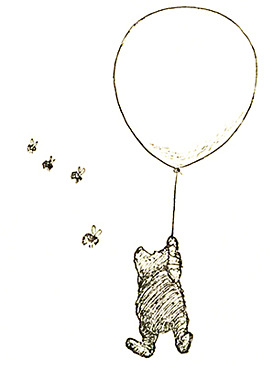 "Pooh began to feel a little more comfortable, because when you are a Bear of Very Little Brain, and you Think of Things, you find sometimes that a Thing which seemed very Thingish inside you is quite different when it gets out into the open and has other people looking at it." "'I think,' said Christopher Robin, 'that we ought to eat all our Provisions now, so that we shan't have so much to carry.'" "Pooh tried to think of something he would say, but the more he thought, the more he felt that there is no real answer to "Ho-ho!" said by a Heffalump in the sort of voice this Heffalump was going to say it in." "'Hallo!' said Tigger. 'I've found somebody just like me. I thought I was the only one of them.'" "'I am a Bear of Very Little Brain, and long words Bother me.'" 'So is a gorse-bush sometimes,' said Pooh." There's always Pooh and Me." "So they went off together. But wherever they go, and whatever happens to them on the way, in that enchanted place on the top of the Forest, a little boy and his Bear will always be playing."